This is one in a series called 9Marks books associated with Mark Dever and others. 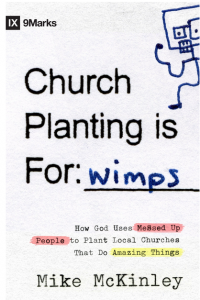 Though I am interested in church planting, this is not my kind of book. McKinley writes from a personal, casual style as if you were reading a blog or, worse, a twitter. The progression of the book is his story of going to the Washington DC area to revitalize an old church. It only covers the first few years and the author admits the story could change at any time. There are some good lessons to be learned and common sense things that a church planter or new pastor will experience. McKinley was sponsored by Mark Dever’s church, Capital Hill Baptist Church. McKinley often plugs the Sovereign Grace Ministries. His Reformed theology (a graduate of Westminster Theological Seminary) is evident in the church polity which he (and Dever) pressed upon the older church.